American Saddlery Combining Quality Craftsmanship & Modern Equine Industry Innovations to create your favorite Saddles. - American Saddlery Combining Quality Craftsmanship & Modern Equine Industry Innovations to create your favorite Saddles. Feel free to call us at 1-800-253-7288 if you have any questions about the application or eligibility. 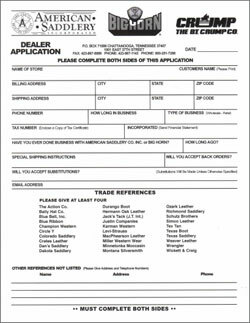 REQUIREMENTS - We require our dealers to have an actual storefront, not to be located too close to an existing dealer and to have verifiable address and credit information. WEB DEALERS - We do not open accounts often for dealers who operate only online or only by catalog. Please contact us for more information. However, any authorized dealer can sell our line of saddles via their own store websites.